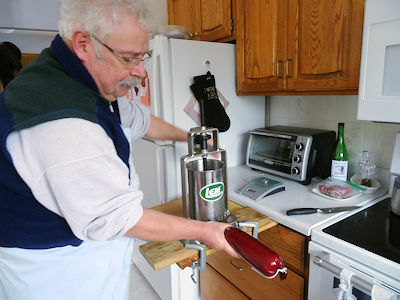 This is the second of the sausages I made when my friend, Marj, gave me some ground Moose. The first was German Bologna. I decided to go with another German sausage, Mettwurst for the second one. Mettwurst is done as a soft sausage served on crackers or as a smoked firmer sausage. I prefer the smoked version. I started by soaking a 20 inch by 2 1/2 inch fibrous casing, usually referred to as a FB casing. These are casings that allow smoke through but are not edible and have to be peeled from the sausage prior to serving. I had 700 grams (1 1/2 pounds) of moose and cut the same amount of fatty pork shoulder into cubes. I put the meat in the freezer for 20 minutes. You will get a finer quality sausage if you keep the meat cold. I ran the pork through the small plate of the grinder attachment on my stand mixer. Then I ran both the pork and moose through the grinder again, alternating the two. I put the meat in the freezer for 20 minutes. Prague Powder #1 is a curing salt made of 6.25% sodium nitrite and 93.75% salt. It is important that you measure it carefully. Too little won’t cure properly and too much is bad for you. I put 1/2 of the meat and 1/2 of the slurry in the bowl of my stand mixer. Using the paddle, I mixed at slow until they were combined. I increased the speed to medium high and beat the mixture for 3 minutes. I repeated this with the second 1/2 of the meat and slurry. Then I mixed both batches together by hand, mixing well. I stuffed the meat into the casing with my dedicated stuffer. The stuffing attachment on my stand mixer does not work well. I put the sausage in the fridge overnight. This let the curing salts work and evens out the spices. The sausage needs to cook slowly at low temperatures or the fat will render out and ruin the sausage. Preheat your oven or smoker to 140 F or the lowest temperature it will cook at above that. Cook the sausage for 1 hour. Increase the temperature 5 F every 1/2 hour until the cooking temperature is 180 F. Cook the sausage to an internal temperature of 155 F.
Plunge the sausage into an ice water bath and let it sit for 10 minutes. Hang the sausage for 2 hours and then refrigerate overnight before slicing. This is a typical German style sausage. It isn’t spicy but it has a big bold meaty flavour that is enhanced by the seasoning and beer. Slice some bread, get some grainy mustard and enjoy! Soak the fibrous casing in warm water overnight. Put the meat in a freezer for 20 minutes. Grind the pork through the fine plate of a grinder. Put the ground pork and beef through the grinder again. Mix the rest of the ingredients into a slurry. Increase the speed to medium high and beat for 3 minutes. Repeat with the second half of the meat and slurry. Mix both batches together by hand, mixing very well. Stuff the meat into the casing and tie off the end. Put the sausage in the fridge overnight. Preheat an oven or smoker to 140 F or as low as it will go (cannot be over 180 F). Cook for 1 hour and then increase the temperature by 5 F every 1/2 hour until the cooking temperature is 180 F.
Cook the sausage to an internal temperature of 155 F.
Plunge the sausage into ice water for 10 minutes. Previous PostMemphis Wings, Coffin Shrimp, Piri Piri Chicken Legs on ShawTVNext PostHome-Made Bacon, The First of Three! I was searching for fleishwusrt and typed in German bologna and found your post. Looking at you blog what is the difference between your German Bologna and the Mettwurst? I am doing some trial recipes this weekend and thinking of throwing in 2.5# of one of these is for everyone to taste. The difference is the seasoning blend. The Mettwurst is a heavier German Sausage with strong herb flavours with a touch of bitter. 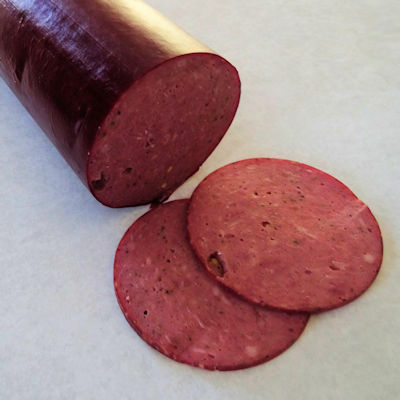 The German Bologna is milder with a coriander base similar to our bologna but a bit stronger. I hope you like them!